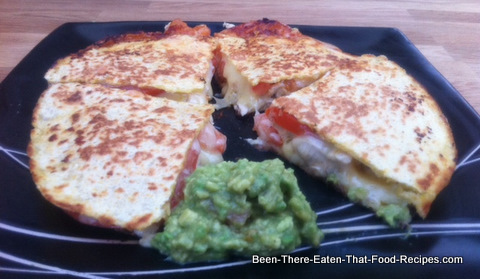 I don't know why they are not as popular as Tacos (find recipe below), but Quesadillas are my favourite Mexican dish. So easy to make and so full of taste! "Quesadilla" comes from queso, Spanish word for cheese, and therefore this is the main ingredient. In Mexico the best cheese to use for Quesadillas is the Oaxaca cheese - a local mozzarella - that melts beautifully when grill. They can be grilled or fried. 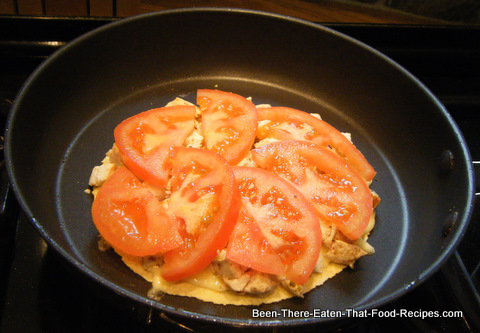 The grilled ones are delicious without all the healthy disadvantages of the fried ones, so my recipe is for grilled Chicken Quesadillas. Have in mind that they are very fulfilling! 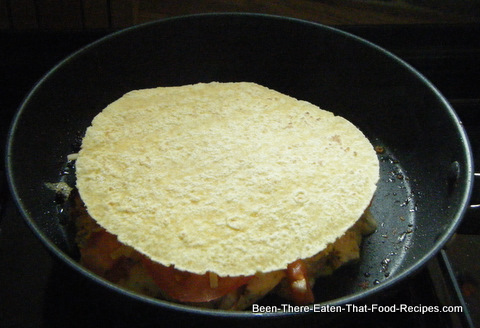 - 2 corn or flour tortillas (bought or homemade ). 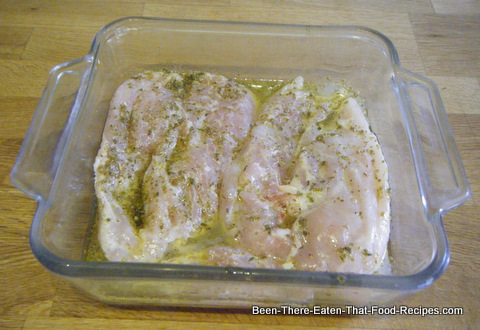 Marinate the chicken for few minutes in the mixture of olive oil, lemon juice, oregano, salt and peper. 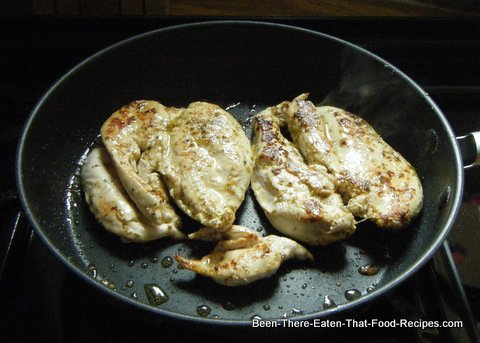 Heat a pan until hot and then add the chicken breast. 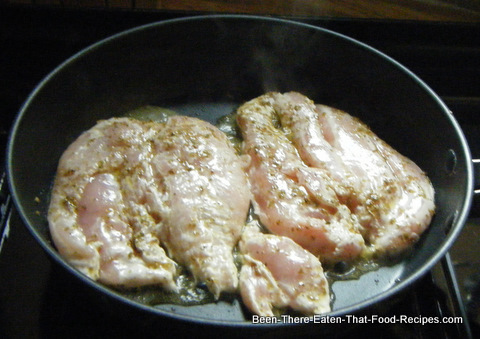 Cook until brown (about 1-2 minutes), then cook the other side and remove from heat. 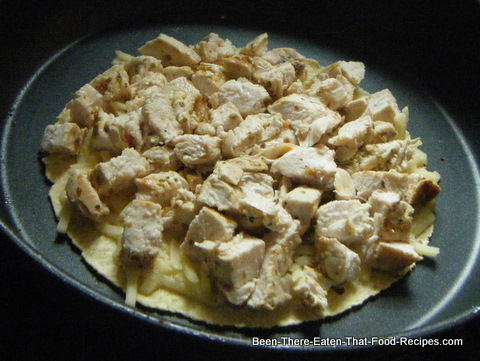 Place a tortilla on the pan on medium heat and add grated cheese on top, avoiding dropping some cheese directly into the pan. Without delay, add the chicken breast (cooked and cut into little cubes). 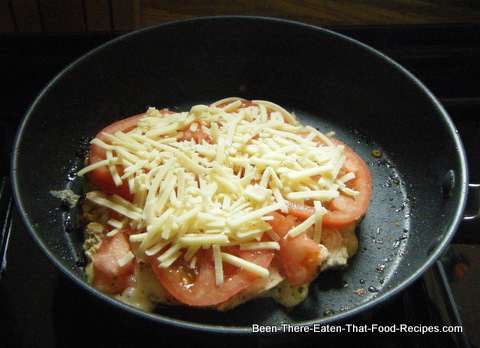 Add the sliced tomatoes on top of the cheese. 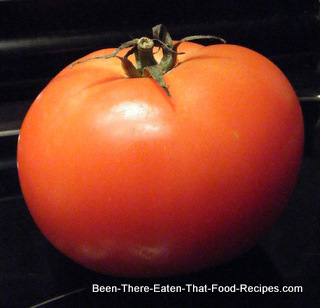 Add more cheese on top of the tomatoes. Cover with a second tortilla, leave for few minutes, making sure that the bottom tortilla is not getting burnt. 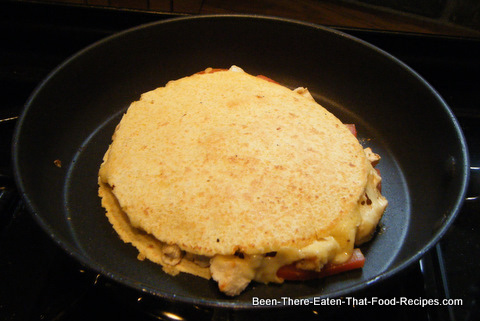 Turn the Quesadilla with the help of an extra plate to have now the bottom tortilla on top and the top tortilla in the bottom, and cook this other side for a further minute. 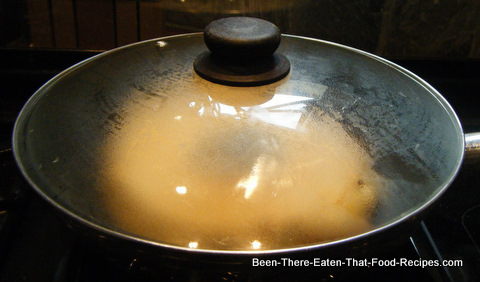 If the cheese is not melt yet, cover the pan with a lid and leave on low heat until melted. 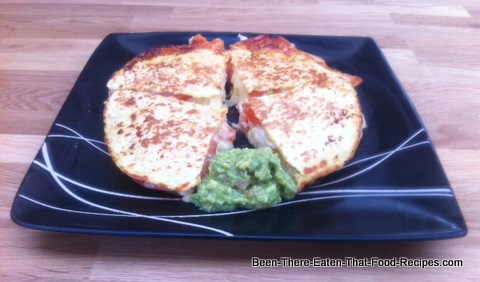 Take the Quesadilla to a serving plate and present with Guacamole. Similarly to what happen with Chili con carne, Nachos are not authentic Mexican food. It is not like Tacos that you will find literally everywhere in Mexico. What I mean is that you are not going to find them anywhere because they are an adaptation made by outsiders of what they considered to be a good Mexican combination, but really, it doesn't exist as such in the country. They are based on tortilla chips (again, not heard of in Mexico) made out of corn tortillas. If you are preparing your homemade corn tortilla , just cut them in triangles to get tortilla chips. Nachos are so appealing and at the same time so simple to prepare, that they are perfect for when you entertain friends and want to serve something they will all love. 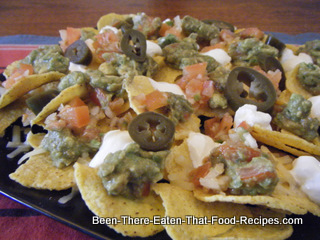 - tortilla chips or your homemade ones. Place the tortilla chips in a serving plate that could go to the microwave. Add cheddar cheese on top and microwave until melted. Add the rest of the ingredients on top. Ready!! In Mexico, Tacos are equivalent to fast food. They are always handy and available everywhere. As part of a proper meal or just as a snack for their office break. Any time is the right time for some Tacos. The Taco shells we find in most supermarkets these days are another example of an adaptation of Mexican recipes, since they don't exist in Mexico. The original Tacos are made with corn tortillas, maybe with wheat tortillas, but never with shells. Anyway we, outsiders, can choose any of the three! The possibilities for fillings are only limited by your imagination. Heat the oil in the pan and cook the onions and garlic until soft but still transparent. Add the mince meat and cook until brown. Apart from the tortillas, add all the other ingredients, mix well, bring the mixture to a gently boil and simmer for about 30 minutes stirring from time to time. Pile up the tortillas and heat in the microwave or in the oven (wrapped in aluminium foil). 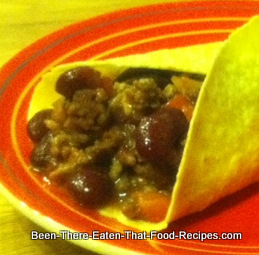 Fill the warm tortillas with the chili mince. Serve the wrapped tortilla immediately accompanied with some Salsa and Sol beer!